We have seen ten of thousands of stones from stone shows, to personal collections to uncountable stones on some of the finest rivers in Northern California. Some stones we see and almost immediately forget, others we see and instantly appreciate them for what they are – beautiful art. Then there is the rare stone that captures one’s imagination and heart. Larry Ragle’s Buffalo stone is one of the rarest of stones for us, it is completely captivating in every way. 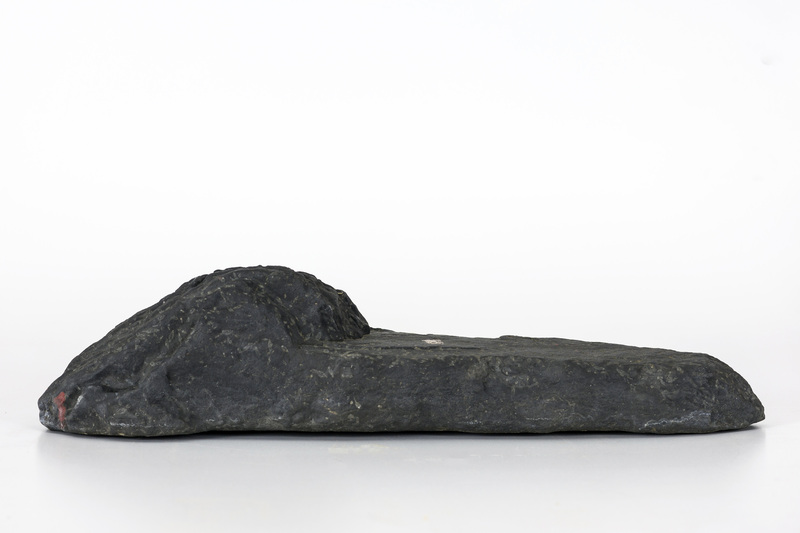 My first encounter with a stone that has a similar feeling for us is Gagyu-ishi (An Ox Pretending to Sleep) formerly owned by Kamiya Yoanken and you can read about that here. The buffalo stone is all natural including the patina and was collected in the mid-1970’s on the Eel River near Garberville, CA. The bottom is naturally flat which really compliments the stone in how it sits. An incredible marvel of nature, how this stone was shaped to resemble in such romantic detail a buffalo in a reclining position will never be known. The Japanese aesthetic appreciates when something mimics nature but isn’t a “photographic” representation in every detail. This lovely stone personifies that feeling for us. The shape, quality of stone, and patina all work harmoniously in near perfection for a viewing stone. What great pleasure and satisfaction it must be to have found this stone, and to have brought it home to add to one’s collection. I know we would have been ecstatic! The stone personifies why we love viewing stones. How long this stone was in the river, who knows? Was it at some point broken to form this shape and then over years of water-flow and sand smoothed to perfection to then one day be placed where Larry was to find it? The stories of these stones to me are almost important as the stone itself. We have been fortunate enough to be around great artwork. Our software was used to manage the art collection of NY MOMA and SF MOMA. We were privileged to be a part of the digitization of the Barnes Foundation collection of impressionist art. From our perspective, this viewing stone easily stands with the very best works of Pierre-Auguste Renoir, Paul Cézanne or Henri Matisse. Let us congratulate Larry on this absolutely stunning viewing stone. 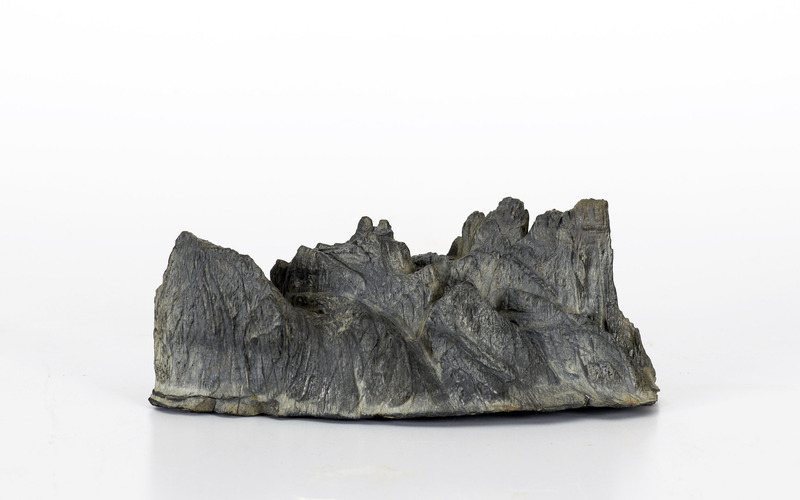 For those of you in the suiseki world we would personally classify this as a Meiseki stone (exceptional suiseki, a masterpiece). Eleven viewing stones are being offered by Paul Gilbert and myself. You can contact me at suiseki@yahoo.com and I will then forward your information to Paul. His stones are the first seven and mine are the last four. Let us know if you have any questions. Click the photo for a larger version. Update: Six of the stones have sold and have been removed as of 4:36pm, 3/15/2018. Ligurian Palombino stone –collected in Italy by Andrea Schenone. 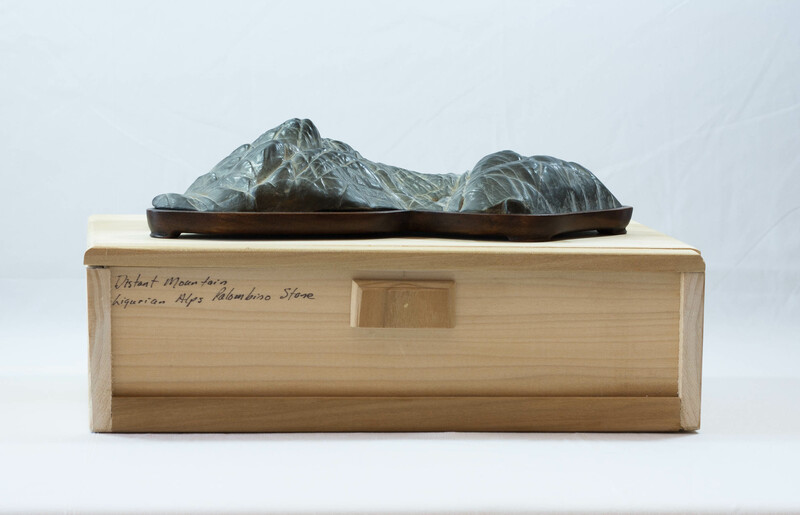 Stone was shown in Visions of the American West International bonsai and stone exhibition in Denver in 2012. Stone has good patina and measures 28 x 17 x 7 cm. $550. 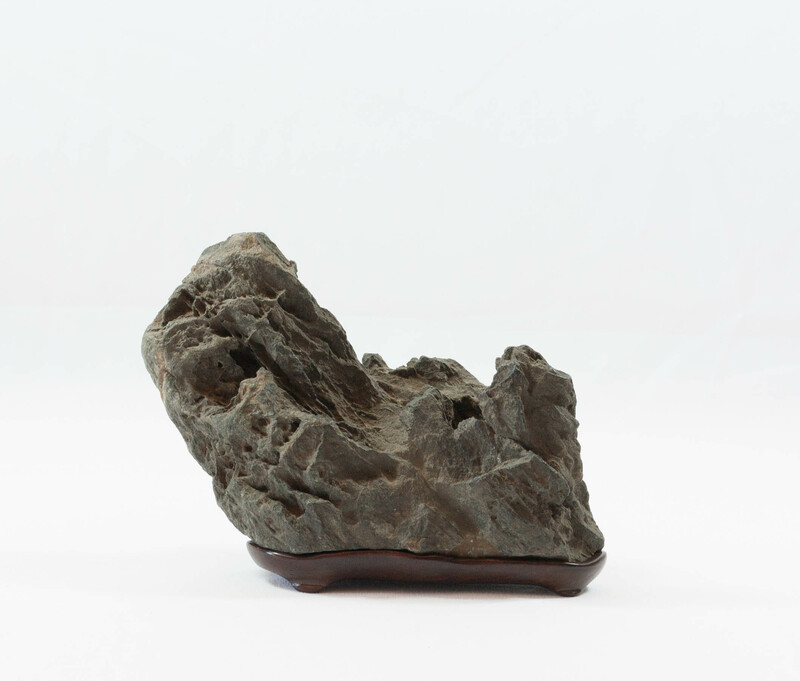 Sajigawa stone with an excellent Koji Suzuki daiza, very expressive mountain stone with a natural bottom. 14 x 12 x 8 cm. $400. 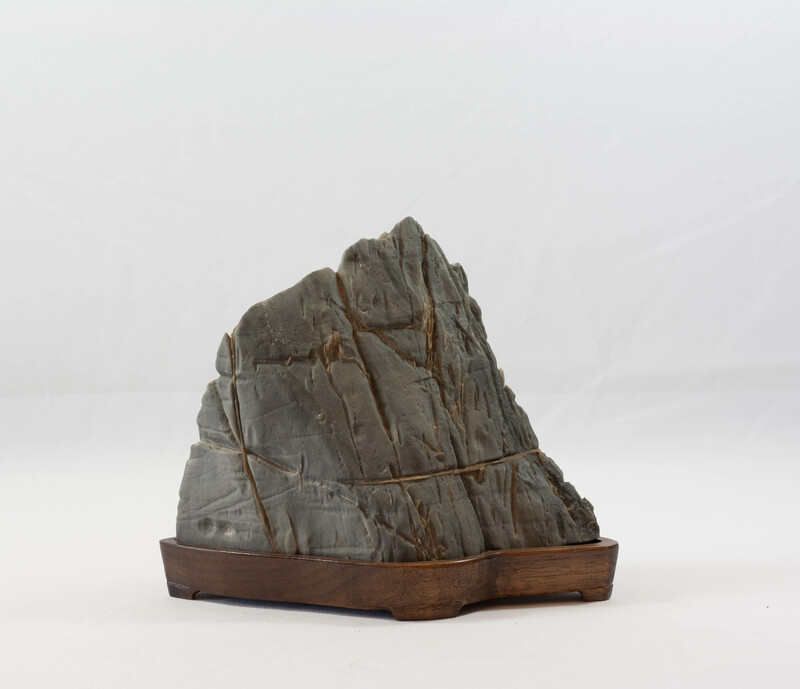 Snowy Range (2), Wyoming mountain stone, with natural bottom, daiza carved from black walnut. Measures 20 x 16 x 10 cm. $190. Doha from the Kamogawa River in Japan. This stone was purchased in Kyoto. It has been outdoors for a very long time and has a nice patina. 24 x 7x 5 cm. $400.